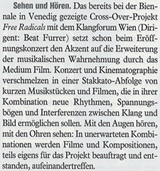 Free Radicals is a crossover project between music and film, developed jointly by Klangforum Wien and the film laboratory of AMOUR FOU. The program will include brief musical compositions and short films rarely heard or seen in standard concert or cinema settings. By combining them, new rhythms, dramatic possibilities and interactions between sound and image are made possible. The central theme of the project is a confrontation with the realities of human perception. Thus the idea of Expanded Cinema is integrated in a variety of ways into the acoustical field of the concert hall and music is broadened to a visual experience: to hear with the eyes, to see with the ears. Possibly the most exciting moments of the program will be those in which film and composition encounter each other directly. 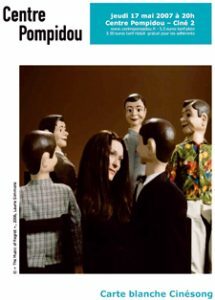 For Free Radicals, Klangforum Wien has commissioned three compositions to accompany Man Ray’s “Le Retour à la raison”, the classic work of Dada-esque cinema, from composers Theo Verbey, Misato Mochizuki and James Clarke. 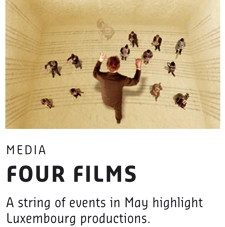 We are proposing the thesis that during these three performances, the public will experience three different films. A second crossover between seeing and hearing takes shape with two films by filmmaker Bady Minck developed for Free Radicals. Here the creative process played out in reverse, the source material was the music. 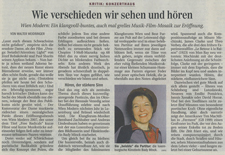 The performers of both films are the composer and conductor Beat Furrer and the musicians of Klangforum Wien. The films and pieces of music make possible a concentrated journey from the radical avant-garde of the 20th Century to the current trends in audiovisual and musical creation. 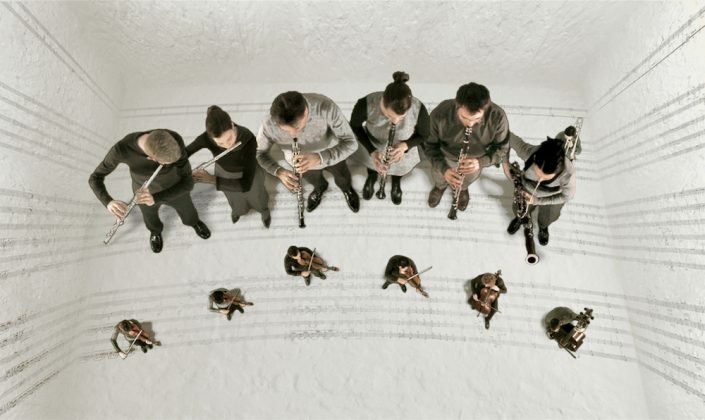 The charm and originality of the program lies in the fact that every work, whether music or film, is made sensually apprehensible in its full artistic range. At the same time, the works are rhythmically combined in such a way that, in the meeting of images and sounds, a new form is created, a multi-faceted evening of coming together and making possible the bridging, the stretching, the compressing and the activating of all the senses. 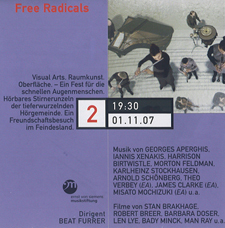 Free Radicals is a melting together of concert and cinematography into a single symphony of pictures and sounds, in a staccato of sound and a flood of imagery. The cinematic spectrum stretches from Man Ray, the pioneer of Dada and surrealistic cinema, films in the spirit of Oscar Fischinger’s visual music compositions from the 1930s, Len Lye’s film scratchings from the 1950s and Robert Breer’s visual pop-art poem “Recreation” to the current work of internationally recognised film artists. 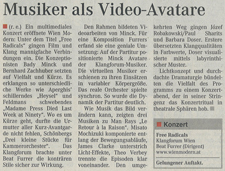 The short film Seems To Be (Schein Sein) works with Morton Feldman’s piece “Madame Press died Last Week at Ninety”. It plays with the levels of optic and aural perception, with the deception of eyes and ears and the tension between two-dimensional reproduction and three-dimensional spatial recreation. 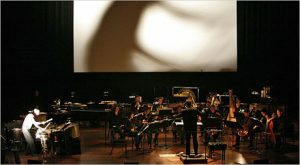 The second film Being and Nothingness works with Beat Furrer’s piece “Ein Lied, das über das Ende des Liedes hinaus ein anderes Ende finden wollte”. 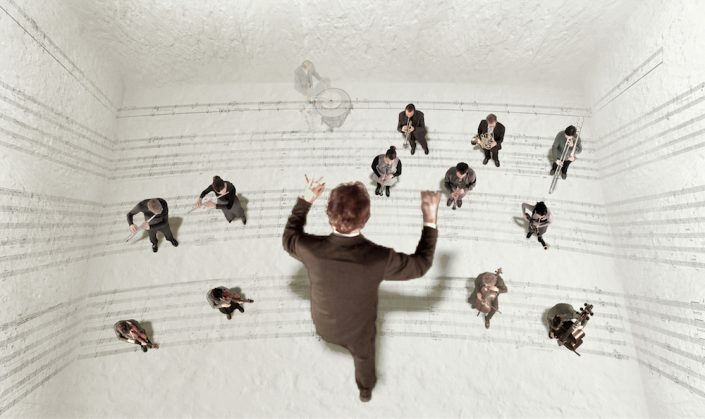 This film makes the generation of music visible, music is poured into pictures: What you see is what you hear. 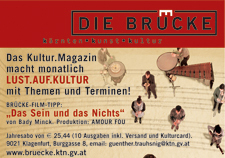 The film shows the dominance of music over the body, its presence and its disappearance. 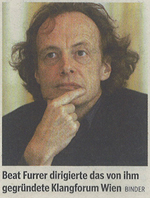 Conductor Beat Furrer appears as the tamer of time and the master of silence. 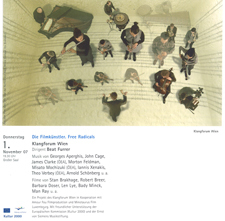 The progressive deconstruction of the music is accompanied visually by a deconstructed image.